The Milky Way is the galaxy that contains our Solar System. Its name “milky” is derived from its appearance as a dim glowing band arching across the night sky in which the naked eye cannot distinguish individual stars. From the Earth, the Milky Way appears like a band because its disk-shaped structure is viewed from within the Galaxy. Galileo Galilei first resolved the band of light into individual stars with his telescope in 1610. In the past, astronomers thought that all of the stars in the universe were contained inside of the Milky Way. Following the 1920 Great Debate between the astronomers Harlow Shapley and Heber Curtis, observations by Edwin Hubble definitively showed that the Milky Way is just one of many galaxies. The Milky Way is a barred spiral galaxy some 100,000–120,000 light-years in diameter which contains 100–400 billion stars. It may contain at least as many planets as well. The Solar System is located within the disk, about 27,000 light-years away from the Galactic Center, on the inner edge of a spiral-shaped concentration of gas and dust called the Orion–Cygnus Arm. The stars in the inner ≈10,000 light-years form a bulge and one or more bars that radiate from the bulge. The very center is marked by an intense radio source named Sagittarius A* which is likely to be a supermassive black hole. Stars and gases at a wide range of distances from the Galactic center orbit at approximately 220 kilometers per second. The constant rotation speed contradicts the laws of Keplerian dynamics and suggests that much of the mass of the Milky Way does not emit or absorb electromagnetic radiation. 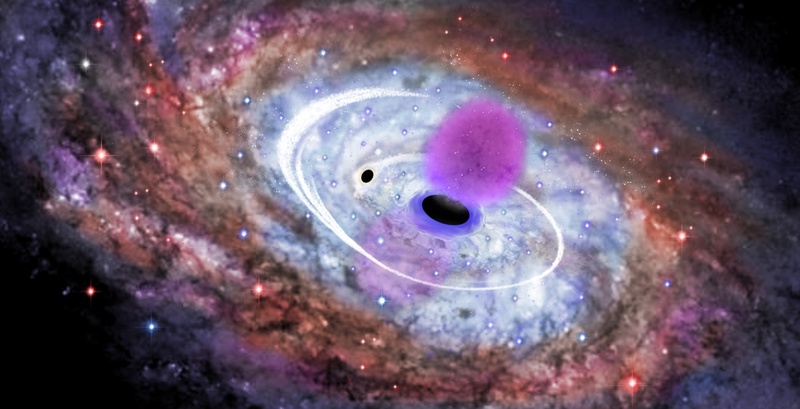 This mass has been given the name “dark matter”. The rotational period is about 240 million years at the position of the Sun. The Galaxy as a whole is moving at a velocity of approximately 600 km per second with respect to extra-galactic frames of reference. The oldest known star in the Galaxy is at least 13.6 billion years old and thus must have formed shortly after the Big Bang. Surrounded by several smaller satellite galaxies, the Milky Way is part of the Local Group of galaxies, which forms a subcomponent of the Virgo Supercluster.